The coolest construction toys are the realistic ones. The big rigs that look just like what’s in the driveway, or the construction vehicles that are miniature versions of the real thing are what kids gravitate toward most. Perhaps not surprisingly, many of the companies that make these kinds of toys are still going strong today, as toy cars and trucks are something that every generation enjoys. Kids are fascinated with construction; it doesn’t matter if they are boys or girls. The never-ending supply of cool construction toys encourages this natural fascination. Give your daughter a Tonka truck and she’ll haul. Toss your son a bucket of LEGOs and he’ll build. And we all know your little ones would be playing with the remote-controlled bulldozer if you’d just hand over the remote – but it really is too much fun to have the bulldozer chase the dog, isn’t it? Here’s a list of some of the toys I loved when I was growing up that are still going strong today. For over 60 years parents and kids think of Tonka when they think of construction toys. 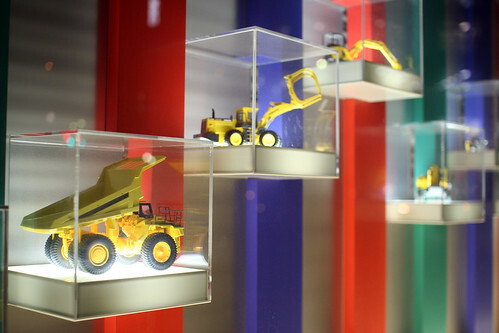 Tonka trucks have been around a long time, and they’ve made some of the coolest construction toys ever. We’ve all played with Tonka’s classic yellow dump truck, but they also have bulldozers, front loaders, mighty dozers, trenchers, garbage trucks, street sweepers … the list is endless! And, Tonka trucks come powered via remote control or your kid’s imagination, which is even more fun to watch while he or she plays. And if the truck breaks down, don’t worry, there’s a Tonka tow truck right around the corner to tow it to the mechanic. Oh, yeah! Tonka’s still cool – even in its old age. And, Bobcat, Gehl, JLG, John Deere and Komatsu have some awesome realistic big rig and construction vehicle toys, as well! LEGOs … they stink when you step on them in your bare feet! OUCH! Other than that, well, they’re just cool, that’s all there is to it. LEGO gives your future truck driver the ability to build his construction toys before he plays with them, and they’ve got construction vehicles and sets covered. You and your kids can build mini-diggers, cement mixers, flatbed trucks, excavators, mining trucks, garbage trucks, the list is as long as the imagination. Some LEGO sets are entire operations, trucks, tools, buildings and the funny looking LEGO people who work the construction operation. LEGOs are cool – just don’t step on them because they really, really hurt! You’ve bought your kid the coolest construction toys, but you’ve heard it anyway: “Mom! Dad! I want a REAL truck, PLEASE!” And, you know as well as I do that explaining the whole you have to be old enough to get a driver’s license, go to CDL training, blah, blah, blah, isn’t going to fly with the ankle biter. So, what do you do? You get a sandbox digger toy and take it to your local park’s sandbox, plop your kid in the “driver’s seat” with a safety vest and construction helmet on, and then let him or her dig until they can dig no more. These toys are super cool, because your kid operates them much like a real sand digger, so he or she really feels like a construction worker. And there are some nice play tool sets and toy workshops out there as well, to give your kid the full experience of running the construction job. If the toy trucks aren’t pacifying the little one anymore, maybe some real digging action in the sandbox will do the trick! I’ve written about some of my favorite toys, as I would spend hours if not days in the sandbox in my back yard building and tearing down and moving earth from one side to the other. These are not only the toys I remember growing up, but also the same ones that I tend to buy for the nieces and nephews that often become favorite possessions after the latest video game gets old or the batteries die in whatever electronic gizmo they got. Parents complain about too much TV, not enough creativity and imagination and too much time spent indoors. The toys that kept us outside “until the streetlights came on” are still out there and still just as much fun as they ever were. What were some of your favorite construction or transportation toys growing up? Was there a moment, while destroying the lawn with your Power Wheels perhaps, that you said “I want to drive for a living!”? What kind of creative or imaginative toys for your children do you like to get them?